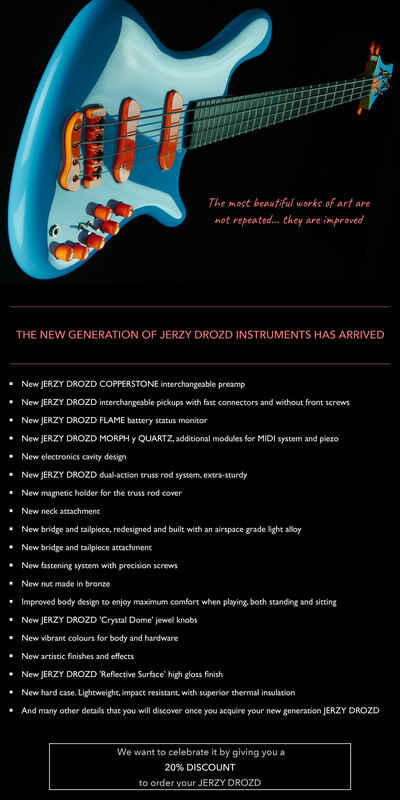 With a powerful sound, flawless aesthetics and featuring the new JERZY DROZD electronics line - COPPERSTONE preamp, JERZY DROZD pickups and battery status monitor FLAME - the new JERZY DROZD instruments are extremely comfortable and lightweight, while durable and solid. The optional modules MORPH and QUARTZ allow integrating MIDI and piezo into any of these beautiful works of art. An outstanding work that deserves to be celebrated. We want to do it by offering you the opportunity to order your JERZY DROZD with a 20% discount. As always, we will be pleased to help you. You are receiving this message because you have subscribed to the JERZY DROZD newsletter.